Hello London, the media partnership formed by Transport for London (TfL) and Exterion Media, has unveiled Cancer Research UK’s innovative advertising campaign on the Tube network to raise awareness and support for this year’s Race for Life events around the UK. Over the next two weeks, as part of Race for Life’s ‘This Is Beating Cancer’ advertising campaign, inspirational moments from Race for Life participants gearing up for this year’s events will be shared live on over 140 digital screens across 25 London Underground stations. 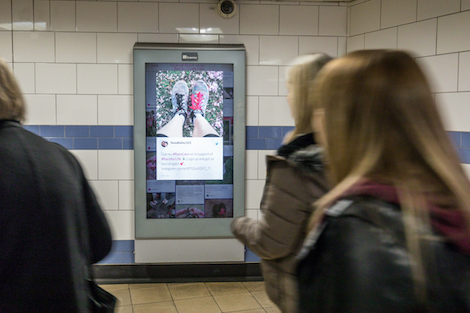 Images and messages from participants tagged #RaceforLife, #RaceLace, @crukraceforlife and @RaceForLife on social media channels will be displayed on digital advertising screens at key Tube and DLR stations including Bank, Bond Street, Canary Wharf, Cutty Sark DLR, Oxford Circus, Paddington, and Waterloo. The images will include photos of people wearing one pink lace in their trainers. As part of the ‘This Is Beating Cancer’ campaign, Cancer Research UK is encouraging people to wear a singular pink lace and share a picture tagging #RaceLace. The lace is a badge of honour for each person, signifying that they are taking part in Race for Life and helping to beat cancer. The campaign was planned and booked by MediaCom and Kinetic. Cancer Research UK’s Race for Life 2017 campaign, ‘This Is Beating Cancer’ is scheduled to appear on 143 digital screens in 26 Tube stations until Sunday May 7, 2017. This entry was posted on Monday, April 24th, 2017 at 11:06 @504 and is filed under DailyDOOH Update. You can follow any responses to this entry through the RSS 2.0 feed. You can leave a response, or trackback from your own site.